Lovely Hampton Gardens renovated and expanded brick & slate colonial marries the elegance of traditional elements with the open concept kitchen design that is so sought after for todays lifestyle. Large foyer opens to formal living & dining rooms and flows back to the great room/kitchen which overlooks a bluestone patio and picturesque back yard. Spectacular cooks eat-in kitchen has hardwood floors, large island, custom cabinetry w/subway tile, gas WOLF/SubZero/stainless & granite w/farmhouse sink and a contemporary feel being open to the vaulted mudroom/side entry. Butlers pantry leads to cozy family room w/heart pine floor, 2nd fireplace & exposed brick. Side sunroom w/arched floor to ceiling windows opens to covered grilling porch & connects back to the great room for wonderful flow. 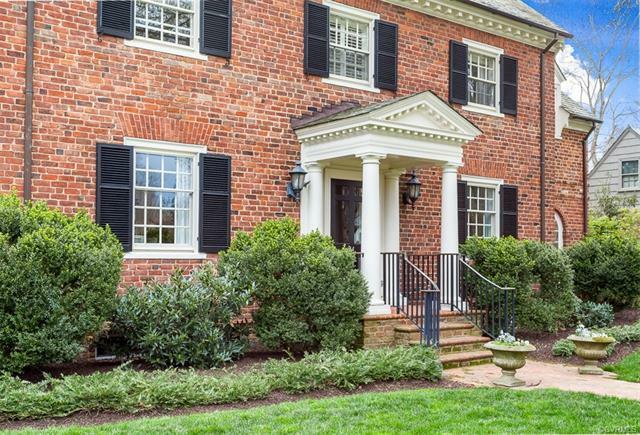 Upstairs boasts master w/spectacular closet, 4 additional bedrooms and updated baths. Basement has office/workout room w/ bath, large rec room and big utility/storage room. Two car garage w/potting room & PRIVATE 2nd FLOOR GUEST SUITE! Fenced rear yard w/established perennial gardens has play area nestled behind arched trellis. An extraordinary home within walking distance of Libbie/Grove.